Nothing makes footballers happier than making their team-mates look silly in training! And this video from Liverpool’s training sessions at Melwood proves it! If you scroll to 4:40, you can see the start of a rondo, where players try to pass the ball around a circle to evade two defenders trying to win it back. 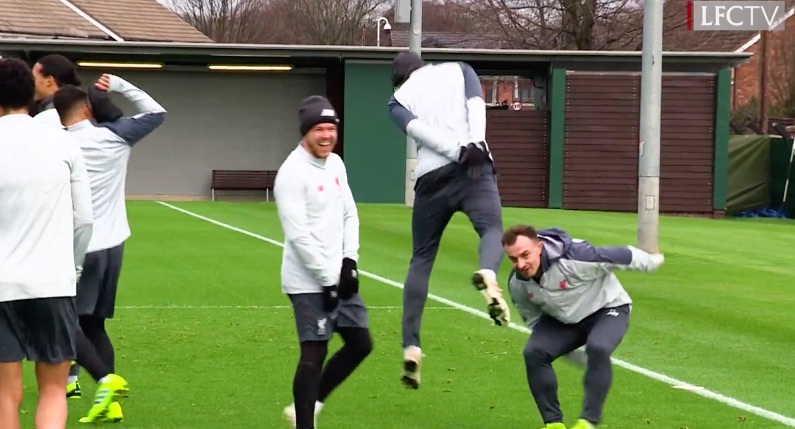 First, Xherdan Shaqiri nutmegs Alberto Moreno, before Joel Matip does the same to Roberto Firmino – which everyone found hilarious! As a result, the rondo breaks down and Matip starts dancing like a salmon. It’s the kind of content we live for, Reds!